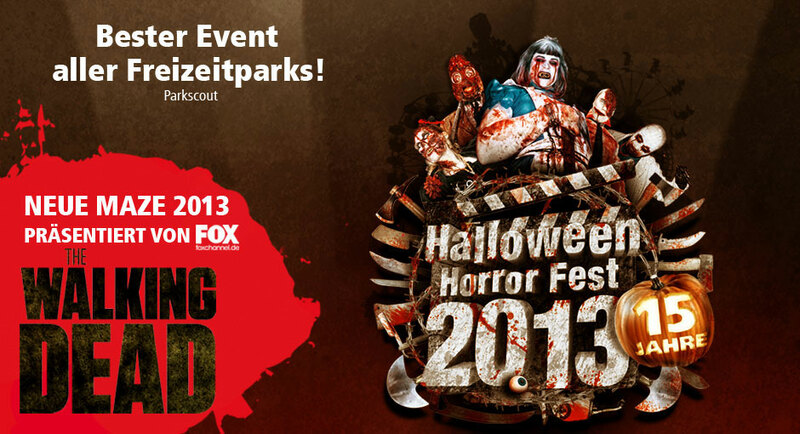 For the 15th anniversary of Halloween Horror Fest, Movie Park Germany offers its guests a top class horror event like never before. Especially the new horror maze “The Walking Dead – Presented by Fox the series channel” delights with its detailed theming and great atmosphere. The guests may also await some acoustic highlights, as the collaboration between Movie Park Germany and IMAscore went far beyond the amount of former collaborations. After IMAscore produced the “Monster Walk” in 2011 – the piece of music which unleashed the creepy monsters every evening and let them go on the hunt for anxious guests – the team produced a new musical opening for this year’s event: the „Monster Walk 2013“, which is faster and more intense than its predecessor. You can hear a snippet of it right here. There’s even more to come: Viktor Neumann, the German voice of Andrew Lincoln’s role Rick Grimes from „The Walking Dead“, who plays one of the leading roles, was recorded. His voice is one of the many details, which will create an unique and redible „The Walking Dead”-atmosphere.